2/19/2017 – It promised to bring levels of excitement and dynamism, and the new format did not disappoint. Three games ended in decisive results, with one hardly a surprise: Ding Liren - Rapport. The game was a mess as expected, and both players sopught to show who was the wilder of the bunch. Adams defeated Salem after he produced super piece centralization, and strangled his rival. Finally, MVL outplayed Li Chao in an endgame to score. Full report with analysis by GM Alex Yermolinsky. The first leg, in Sharjah, is being held from February 18 - 27 (with a rest day on the 23rd) at the Sharjah Cultural & Chess Club. The time control in the GP tournaments is 100 minutes for the first 40 moves, 50 minutes for the next 20 moves and then 15 minutes for the rest of the game plus an additional 30 seconds per move starting from move one. The first prize is €20,000; the total prize fund is is €130,000. While the underlying principle of the FIDE Grand Prix is unchanged, the structure brings some fundamental modifications that have significant repercussions. This is not to imply they are bad though. The idea remains to organize four major tournaments that bring in a number of the world’s best players, and let them duke it out to find the two best overall performers and give them a spot in the next Candidates tournament. ... Hou Yifan arrived as her chipper self. Initially she had been slated to play the Grand Prix, then she ducked out of it, and was replaced by Wei Yi. Finally, at the last minute, it was announced she woujld indeed play in the Grand Prix, and the Chinese Chess Federation, with whom AGON had been negotiating this, was more than happy to oblige. What has changed is the number of players who are allowed to participate, 24 in all with 18 per event, increasing the opportunities for players not already in the top ten, and give them a chance at a fairy tale result. One need not worry this is a return to the massive 20+ player round-robins that were not unheard of in the 60s and 70s. This will be a reduced Swiss Open with 18 players played over nine rounds. For the players, this changes the dynamic considerably. For one thing, it means that contrary to a round-robin where you not only know who you will play and when, but you even know the color. Here, every day will mean a surprise, and since the number of rounds is odd, even the colors can be swapped if circumstances warrant it. Security was tight and the players were thoroughly scanned, searched and prodded before entering the playing hall. Shoes were understandably checked very closely. Hou Yifan's game against Ian Nepomniachtchi was far from dull, as both set out complications that left the engineless spectator scratching his head, but ended in a draw. Maxime Vachier Lagrave had an intriguing bout with Li Chao, one of the three Chinese players in the Grand Prix. The Frenchman seemed to have a lingering edge, but it was not obvious it could be squeezed into a win, though that is exactly what he did. Hikaru Nakamura never got anything to work with against Dmitry Jakovenko, and while he squirmed and squeezed, it was to no avail and they drew. Jon Hammer faced Alexander Grischuk in a tough game, but the curious thing was the position in which they agreed to shake hands and call it a day. While it's true Black is a pawn down, White's pawns are hardly an issue, and Black has both the bishop pair, and a very thorny a-pawn that could easily be advanced the next move to a2. After that Bh7-g6-f7 would secure the pawn and an advantage. The Norwegian undoubtedly appreciates he is the underdog not only in the game, but in the event, however if he does not seize the chances when he gets them, there will be no Cinderalla endings awaiting him at the end. ...the incredibly active and entertaining Richard Rapport. 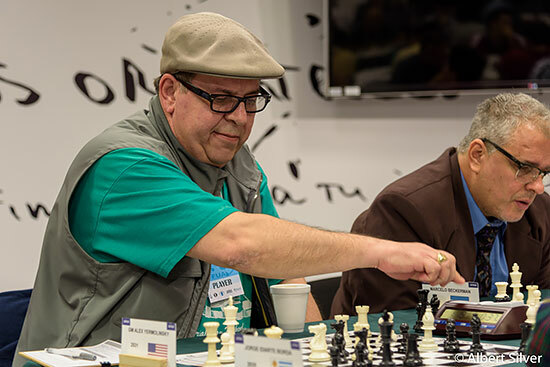 Guest commentator Alexander Yermolinsky, who once crossed swords with Garry Kasparov back when they were juniors in the Soviet Union, brings in his experience and knowledge as he annotates the game between the two firebrand players. << Tehran WWCh Rd3 G1: Play by the Book! A 9 round swiss with just 18 players is more than a little awkward. I wonder how it will play out. Is this one of the the WC qualifying tournaments? If so how do you qualify to play in it? i.e. One wouldn't expect Hammer, Hou, Salem, and Riazantsev to qualify. There are many higher rated players. I am very glad that the FIDE managed to find a tournament format that is attractive for chess fans: Swiss format and odd number of games. In my opinion, round-robin tournament is boring. Chess is a very fair game, and it is therefore necessary to tournaments also bring an element of chance and luck. Hou Yifan vs Ian Nepomniachtchi was interesting. The computer doesn't like white's play, but it works out fine in the game. The computer may be right, but it requires a lot of work from black just to avoid problems. Nakamura was almost as stubborn as Carlsen! lol Adams was very tricky. Grischuk-Hammer was exiting, regardless of the standoff type end result.